Research into animal intelligence is still in its early stages, but has already found that animals have amazing problem solving abilities comparable with a young human. Unfortunately, wolves and dogs didn’t make it into the most intelligent animals, but some cute Nepalese mountain pups did make it onto Marc Latham’s travel25years blog. Hi, it’s Chris Packwolf, natural world correspondent in the Greenygrey world. I’m delighted to announce that my human parallel Chris Packham presented a fascinating second episode of Inside the Animal Mind. It premiered last night, and is now available on BBCiplayer (just in U.K. I think, so there is a detailed description of the main points below). Chris Packham presented amazing footage of animals such as corvids (crow family), parrots and great apes using tools. These animal skills were only discovered in the last fifty years. The animals have been doing it much longer, it’s just that humanity is only now able to study it. Although filmed footage of animals using tools has been around for a few decades now, studies into their thought processes and the limits of their skills are still in their early stages and ongoing. In last night’s documentary, Chris Packham said and showed how the most recent studies have revealed that the most intelligent animals have four brain attributes and skills that were thought to be exclusive to humans half a century ago. They understand cause and effect: that filling a bottle with water will make the food inside fall out. They have flexible thinking: a bird who’d used stones to reach food in one type of study used them differently in another. One bird was shown solving an eight-part test to reach food: using a small stick to release three stones, which when placed in a container released a longer stick, which could reach the food.The greenygrey again stayed in the background, but this time played a different, more natural, role. Another bird understood that putting stones into a jar filled with water would make the water rise, and that would bring a grub into its reach. The scientist said they didn’t do it if there was no water in the jar, so they understood it only worked by raising the water level; that if there was no water, the stones would just bury the grub. They use imagination: looking at a problem, imagining how procedures work and then putting them into practise. A cockatoo was shown solving an intricate problem it’d never seen before: in a different way to how it had done it previously. This showed that it had identified difference, and thought up a new solution rather than acting on instinct. They can mentally time-travel: tests showed that western scrub jays could plan ahead. This was shown in a Big Brother style task with one jay given breakfast in its cage for a week, and another not given breakfast. The latter jay stored five times as much food as the one who expected breakfast, showing that it was thinking in the past and future as well as the present; and as it was a new situation it wasn’t just acting on instinct. Perhaps acting on instinct, corvids of course starred in the Merrymook Rowdy Rook classic episodes of the Werewolf of Oz: Fantasy Travel by Google Maps, and a jay called Jay joined Grey for the last adventure of the book. Hi, it’s Greenygrey. Love is in the human air today as Valentine Day is celebrated. But it’s not only humans that exhibit love you know. I know because I am of course a werewolf, and know both my human and wolf sides. 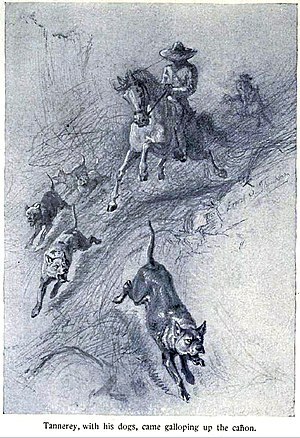 And one of the greatest love stories ever told; well, it was in fact real; was that of Lobo and Blanca, two wild wolves living in a time of change in the American West. They eluded capture by ranchers for months, but Blanca was eventually trapped, and her scent used to trap her pining partner Lobo. That wasn’t the end of the story. The tear-jerking broken-hearted ending to this famous wolf love story and more information are available in Marc Latham’s new Suite 101 Natural World Media article. 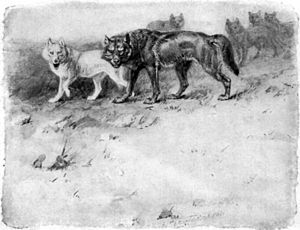 Although there wasn’t a happy ending for the Lobo and Blanca love story, their intelligence and devotion did turn their captor, Ernest Thompson Seton, into a wildlife and conservation advocate. Moreover, the story of Lobo and Blanca he told inspired a Disney movie and BBC documentary; as well Sir David Attenborough, who has been producing groundbreaking wildlife documentaries for over half a century.